Nepal Communist Party Unified Maoist Chairman Pushpa Kamal Dahal speaking at the Deusi bhailo of Reporter’s club Nepal. 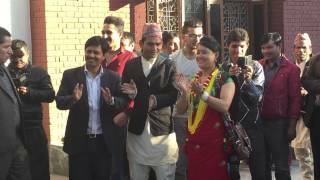 26 October 2014 Kathmandu – As all Hindu community celebrating Diwali festival around the world, Nepal’s Journalists have organized a deusi bhailo program to visit all major political party’s leaders and get assurances of writing the new constitution and end the peace process to a logical ending. Maoist supreme commander Prachanda enjoying dance and expressing his views on upcoming event of constitution drafting and implementing them in purposed time. Prachanda highlighted the situation and expressed his concern about the urgency of consensus between parties and make a single mandate to promulgate new constitution before end of December this year.